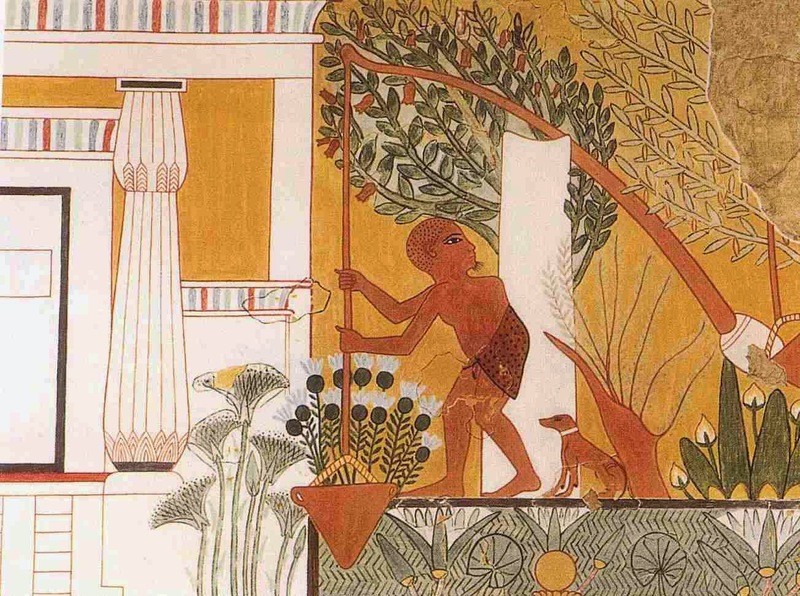 ...witness the "Gardening Agreement" between Talames and her gardener Peftumont, c. 500 B.C, Egypt. If you intend to be gardener for me in my garden, then you are to give water to it. You are to give 8 drawings of water to it, in the proper measure of 28 hins of water to the pot and you are to give 20 drawings at the beginning of the water of inundation and 20 afterward. You are to connect the dike to my garden according to the drawing which you shall cast; and you are to put it behind the gardens; and you are not to cause me to compel you to do it. I am to ask you for your work at evening, and you are to give it to me, when it is complete and whole. And you are to twist and splice 200 cubits of rope...and you are to stitch 4 earth-baskets; and you are to give them rims; and you are to give them their handles. And you are to make them as your work at evening, and you are to give them to me, when they are complete, for the cutting which is to be made to my garden. And I am to ask you for your dung three times daily; and I am to probe it with a stalk of flax. The grape seed which I shall find in it, I am to take one silver coin to the seed among them. Yes, his bowel movement was examined to see if he was eating her grapes. Plus he only got his wages in wheat (which he had to pound and grind himself) or bread, and he had to bring a spear and a sword to defend himself from the hyena and the wolves. On the plus side, she promises to bail him out if he gets arrested. Read the whole contract (there are gaps in the translation) here. Appropriately, the contract is inscribed on the clay pot (above), now in the collection of the Oriental Institute of Chicago. 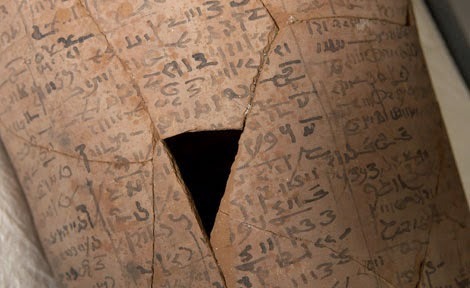 Some Egyptologists think it might be satire. Thank you for another informative and absolutely fascinating post! Love this - made me smile. The looking for grape seed ritual reminded me of something I read in a biography of Catherine the Great of Russia. The Russian nobility would make their serfs sing during the harvest. This was to insure that nothing being harvested was being eaten! So perhaps your Egyptian story is not satire.